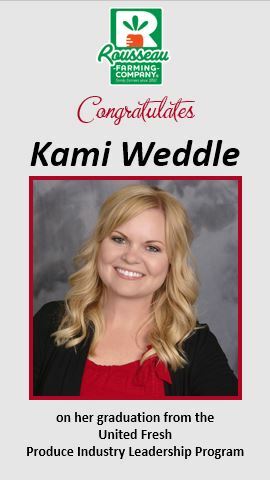 Kami is an Arizona native and graduated from University of Arizona in May of 2004 with a Bachelor’s in Microbiology and a minor in chemistry. She then moved to the United Kingdom and completed a Master’s of Science in Business Management at the Norwich Business School in 2006. Kami began her career as Food Safety Coordinator for Rousseau Farming Company®, and has since evolved into her current position as Director of Food Safety & Quality. Similar to most food safety professionals other responsibilities include items such as Product Quality, Air Quality Management, Pesticide and Workplace Safety and Health. She has served on the Arizona Leafy Green Marketing Agreement Technical Sub-committee since 2009 and assisted with the development of food safety employee training kits for growers to utilize. Kami has received formal training in HACCP programs, GAP/GMP policies and oversees the 3rd party auditing program for the farm. Away from work Kami is an avid U of A sports fan and enjoys cheering on the Wildcats during March madness. She also currently serves on the U of A CALS Alumni board. When Kami is not working she most enjoys spending time outside at spring training baseball games, taking the jeep out on Arizona trails with family or being out on the lake.